AlumiTech Tonneau Covers don’t take up any space inside your truck bed! Note : As of 19-Feb-2015 it appears as if this company is no longer in business. The AlumiTech Tonneau Covers went through a name change and were called EnDuro Covers for a short period of time before the product line was discontinued. The product line was purchased by Prarie Diesel (306-682-2900 Joey Dosch) in Humboldt Saskatchewan but does not appear to be available at this time. 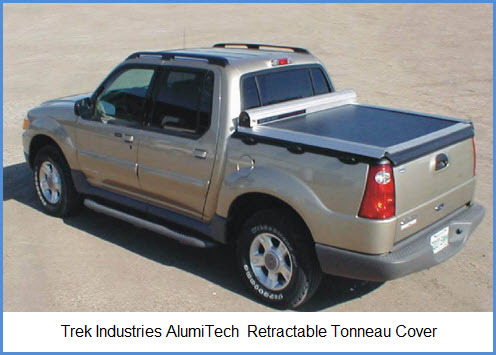 The AlumiTech Tonneau Covers were retractable truck bed covers that Trek Industries(the manufacturer) claimed were waterproof without using drain hoses or reservoir tanks. And they should have known, they made this roll-up tonno since 1988 and used it continuously in Saskatchewan Canada since that time. They said that if the cover withstood prairie winters up there, it would take the winter anywhere! Anyway, it had lots of nice features you can check out below. To bad it's no longer available. Cover Weight : 65 lbs.